Monday, 27th May 2013. Palm oil futures making its way to return to the upside, at least for now. Other news to follow. "-U.S. stocks ended slightly lower Friday--though blue-chips squeaked out a mild gain--and broke a four-week winning streak as anticipation of the end to the Federal Reserve's quantitative easing cooled a rally that's repeatedly knocked through highs. The Dow Jones Industrial Average DJIA +0.06% was up 8.6 points, or 0.1%, to 15,303.10 at the close Friday. It fell 0.3% for the week. The S&P 500 SPX -0.06% fell 0.9 point, or 0.1%, to 1,649.6 Friday, down 1.1% for the week. The Nasdaq Composite COMP -0.12% lost 0.27 point, or 0.01%, to 3,459.14 Friday. It fell 1.1% for the week." "- Japanese shares ended modestly higher Friday after a roller-coaster ride that subjected the Nikkei Stock Average to a swing of more than 3% on both sides of the previous day’s close. Other regional markets ended mixed after also charting a choppy course, with Australian stocks tumbling as banks and resource stocks skidded amid concerns about the outlook for the local and Chinese economies. The Nikkei JP:NIK -3.54% finished the day 0.9% higher in Tokyo, a day after it plunged 7.3% for its worst drop since a disastrous earthquake and tsunami struck the country in March 2011." "-July Soybeans finished down 23 1/4 at 1476 1/4, 29 1/2 off the high and 5 up from the low. November Soybeans closed up 4 3/4 at 1247 3/4. This was 8 1/2 up from the low and 2 1/4 off the high. July Soymeal closed down 8.8 at 428.2. This was 1.2 up from the low and 9.5 off the high. July Soybean Oil finished down 0.42 at 49.24, 0.67 off the high and 0.07 up from the low. The soybean market traded mixed to lower for most of the session with losses in the July contract while November soybeans found support. The July/November spread broke sharply lower following yesterday's volatile trading session. Basis continues to setback in the country as processors get run over with fresh supplies. Farmer sales have been active all week which has helped to replenish supply pipelines at least through June. Outside markets were slightly negative with energies and metals lower which didn't help the broader commodity complex. November soybeans traded sharply higher early in the session but support was mostly coming from profit taking in long July vs. short November positions. Traders were heading to the sidelines ahead of the long holiday weekend where many expect soybean planting progress to show significant strides from last week." FCPO- Steady Positive Momentum Building Up. Let us assess this upside momentum that has been supporting the market to recover up to 2,372 level last Thursday. Volume building up with price hike, higher lows, higher high, support trend line identified, fast moving average is above slow moving average on hourly time frame and above, all checked. So, are we set to go Long and go away ? The answer is yes if you get to Long way earlier around 2,290 level and no if you just Long at last Thursday high. You might be subject for some serious profit taking or retracement this few session as the oscillator is very much staying at overbought reading. It is not certain to expect market would retrace if there was any overbought reading but when the market just coming back to trade after a long holiday, trader can expect heavy price adjustment in the opening session. Fortunately, price adjustment does not meant to be a correction, it can be a surge or gap up on opening session, it is how market digest overnight information. From medium term perspective, the benchmark Aug is hovering on Bullish momentum with more and more higher lows and higher high formed since last two weeks ago. These Bullish candle formations are vital to signify that market has shift its previous medium term Bearish outlook to more Bullish outlook. 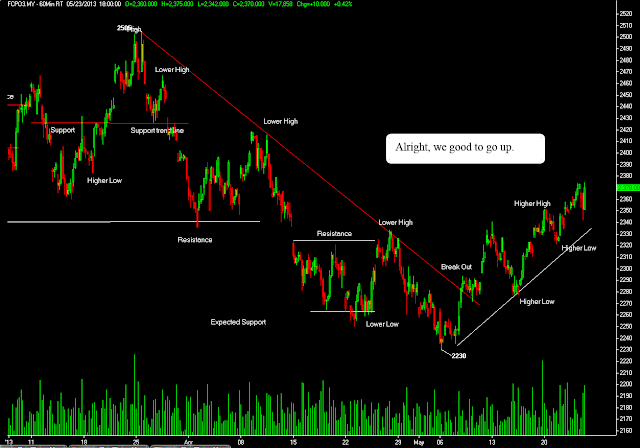 For longer term perspective, palm oil futures is still stuck within a big consolidation phase. Today, pivot support for Aug contract is located around 2,349 while resistance is pegged at 2,395.